It’s the timeless story of a man, a hot tub, a sausage, a drone, and the hefty fine that ruined their good time. 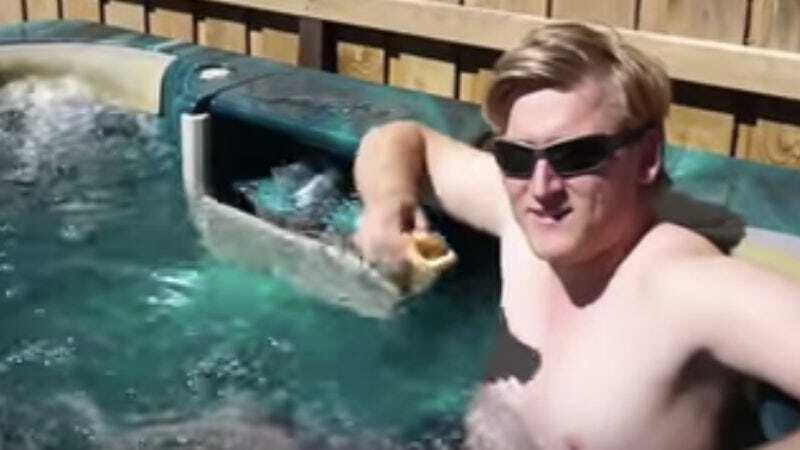 Vice reports that an Australian man known only as Tim is in both figurative and literal hot water after using a drone to bring him a sausage from a local vendor as he lounged in a hot tub. Funny, right? Not to the Civil Aviation Safety Authority of Australia (CASA), who may slap the Aussie with a fine of up to $9,000 AUD ($7,000 USD) for his tomfoolery. “A busy retail car park is never a sensible place to fly a drone,” CASA spokesman Peter Gibson told local news. “If the drone flyer lost control of the machine right above the people at the sausage sizzle there would be a real risk of injury.” Sounds like this buzzkill could use a good soak himself. It should go without saying that you shouldn’t try this at home, not just because it’s dangerous, but because Tim’s sausage was apparently freezing cold upon arrival. Nobody likes a cold sausage, let alone a guy in a hot tub.